This travel article by Ray Cavanaugh appeared in The Washington Post. 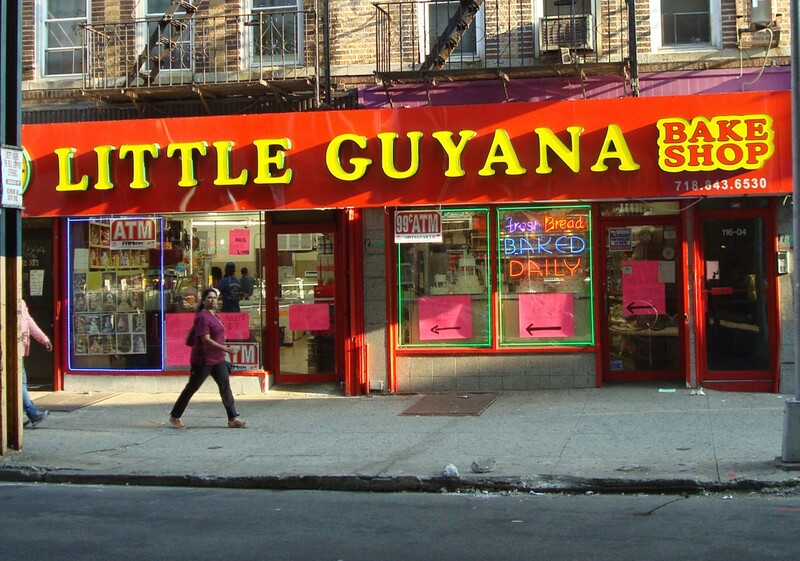 Nobody told me about Little Guyana, a mile-plus-long stretch in the Richmond Hill neighborhood of Queens where the residents are Indian but sound like Bob Marley when they speak. I discovered it by accident when I fell asleep on the A train, passed up my intended destination and was awakened by a fellow passenger telling me that the train had reached its last stop. The people here, known as Indo-Guyanese, are mainly descendants of indentured servants who were recruited from India (often by deceptive tactics) to work on the sugar plantations of present-day Guyana — formerly known as British Guiana — starting in 1838, when the British abolished black slavery in their colonies. I was surprised to learn that the Guyanese are New York’s fifth-largest immigrant group, according to American Community Survey figures reported by multiple media outlets. It’s probably safe to say that many, if not most, Americans know little or nothing about Guyana, a small nation on the northeast coast of South America, although some may recall the 1978 Jonestown atrocity, in which cult leader Jim Jones persuaded (or forced) more than 900 of his followers to commit suicide by drinking poisoned Kool-Aid in the agrarian utopia he’d founded in that country. Aside from a few Creole-sounding words, there’s no real language barrier in this neighborhood. Guyana is South America’s only English-speaking country. It’s also considered part of the Caribbean, and this West Indies connection accounts for the Bob Marley accent here in Little Guyana, a neighborhood that began to take shape in the 1970s. Upon my unplanned arrival, I exited from the subway station onto Liberty Avenue, which cuts through the Queens neighborhoods of Richmond Hill and Ozone Park, and is the throbbing heart of Little Guyana. Refreshed by my subway snooze, I felt like walking a mile or so in the direction of the place I’d intended to visit. This intended destination was soon forgotten, though, as the Little Guyana carnival atmosphere cast its spell on me. It would be difficult to overstate the vibrancy: I was hard-pressed to pass a block of storefronts without witnessing the full color spectrum on display. Nearby 101st Avenue has considerable flavor, but nothing approaching the bewitching carpet ride of Liberty Avenue. The Little Guyana strip runs from 104th to 130th Street. I noticed an Indo-Guyanese presence before and after these streets, but the cultural dynamism began to dissipate. I kept hearing a wild type of music that I later learned is called “chutney.” It contains sounds of the Far East, but has a faster tempo and a more pulsating beat, reflecting the Caribbean influence. Because the weather was pleasant, cars with open windows kept delivering a loud dose of chutney. In many cases, though, open windows were superfluous; some vehicles were equipped with speakers that blasted the music as if it were a block party. Aesthetically, Liberty Avenue is less than flawless. Suspended overhead is a subway rail, an old structure that emits a cacophony of squeaks every few minutes as a train passes by. I also had to dodge some bird droppings. Urban grit is rife, but there’s no real danger. The strip is bustling and unabashedly commercial. A house of worship might stand 30 feet from a rum joint and right next door to a henna tattoo parlor. Within three minutes of people-watching, I’d spotted Hindus, Sikhs, Muslims and cross-wearing Christians passing by the same street corner. In a five-block radius you’ll find a Pentecostal church, a Jehovah’s Witness kingdom hall, a Shri Lakshmi Narayan Mandir Hindu temple and an Islamic clothing store. There’s also a spiritual venue directly beneath a subway entrance. This is called the Sri Durgamatha Astrological Center, where you can ascertain your everlasting destiny, for better or worse. I tried to go in, but the place was closed. Hopefully, there was no deeper meaning there. Although many women go about in Western garb, I saw no shortage of saris, the traditional Indian dress, or sari shops, where prices range from a few dollars to many times that amount. My bargain-hunting senses were titillated by the DVD boxes full of low-priced Bollywood flicks at many spots along the strip. Guyanese people do NOT by any stretch sound like Jamaicans. SMH. The author could have more accurately and less generalising / ignorant (I know he meant well – but it was really an ignorant comment) just referred to them as sounding West Indian / Caribbean.